It’s no surprise that consumers prefer digital communication—especially text messages—built into their new-vehicle shopping and purchase experience, according to the latest J.D. Power U.S. Sales Satisfaction Index (SSI) Study.SM The 2018 study includes customer evaluations of 32 rank-eligible brands in two segments (14 luxury brands and 18 mass-market nameplates). The 2018 study is based on responses from nearly 26,000 buyers who purchased or leased their new vehicle in April or May of this year and examines experiences of those consumers who shop at dealerships but purchase elsewhere. Overall satisfaction with the new-car sales experience this year averages 823 (on a 1,000-point scale). Most significantly, sales satisfaction increases by 19 points to 839 points for customers who texted with their selling dealer vs. those consumers who did not (820). Personal or face-to-face communication is still the most common way for customers to connect with their selling dealer in both the luxury (89%) and mass-market (90%) segments. Luxury dealers (21% of the time) use text messaging more than mass-market dealers (15% of the time). Sales satisfaction is markedly higher among buyers who text before visiting a dealership (850) than industry average (823). Further, buyers who indicate their dealer is “very effective” in providing pre-visit information have higher sales satisfaction (875) than those who say dealers’ pre-visit information is “somewhat effective” (715). Before the first dealership visit, only 8% of buyers communicate by text. Pre-visit texting is slightly higher with Gen Y* (11%) and Gen X buyers (10%). In contrast, Boomers (6%) and Pre-Boomers (3%) are least likely to text beforehand. Follow-up after vehicle delivery enhances sales satisfaction by 38 points, but the study finds dealerships contact customers only 79% of the time to make sure that the sales process was satisfactory. Porsche ranks highest among the 14 luxury brands included in the study with a score of 828—an improvement of 10 points and three rank positions from last year. Infiniti is second, improving its score from 821 to 824 this year, while Lexus (823) takes the third spot. Mercedes-Benz (815) ranks fourth, while Lincoln (814), which received the highest score in 2017, ranks fifth this year in a tie with Cadillac. Also, Audi (804) advances to match the luxury brand average. Mass-market brand Mini (798), which ranked second last year, receives the highest score among non-luxury nameplates in 2018 despite a 5-point decline from last year’s 803. Among the 18 rank-eligible mass-market brands, General Motors’ nameplates fare well with consumers. GMC (797) ranks second, while Buick and Chevrolet tie for third with 792. Ford (788), Subaru (776), and Ram (771) also perform at or above the mass-market average (771) in sales satisfaction. When shopping for a new vehicle, check out brand websites and browse local area dealers’ websites to enhance your shopping and buying experience. Skim customer-written dealer reviews online for more information. When visiting a local dealer website, look for pop-ups with Instant Messaging or texting opportunities to get information quickly and to make personal contact. Digital representatives can get you primed for your buying process. Make sure to research how a new-car model performs in terms of initial quality, its overall appeal, and dependability during the first three years of ownership by perusing new car ratings and reviews. The U.S. 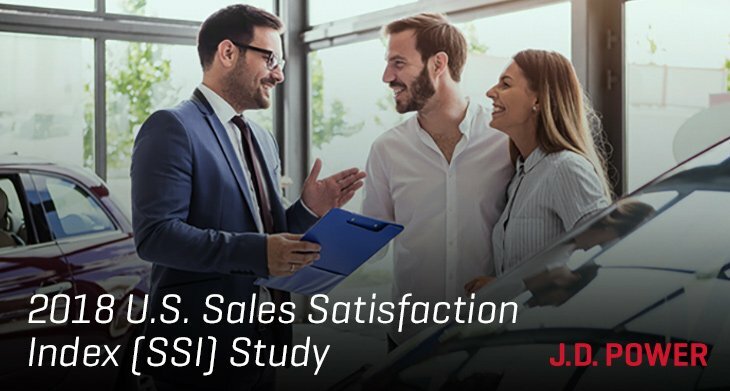 Sales Satisfaction Index (SSI) Study—redesigned in 2017 and now in its 32nd year—measures satisfaction with the sales experience among new-vehicle buyers and rejecters, who are those who shop a dealership and purchase elsewhere. Buyer satisfaction is based on six measures: dealer personnel (28%); delivery process (21%); working out the deal (18%); paperwork completion (16%); dealership facility (13%); and dealership website (4%). Rejecter satisfaction is based on five measures: salesperson (40%); fairness of price (15%); experience negotiating (15%); variety of inventory (15%); and dealership facility (14%). The 2018 study is based on responses from 25,748 buyers who purchased or leased their new vehicle in April or May 2018. The study is a comprehensive analysis of the new-vehicle purchase experience and measures customer satisfaction with the selling dealer (satisfaction among buyers). The study also measures satisfaction with brands and dealerships that were shopped but ultimately rejected in favor of the selling brand and dealership (satisfaction among rejecters). The study was fielded from July through September 2018. *J.D. Power defines generational groups as Pre-Boomers (born before 1946); Boomers (1946-1964); Gen X (1965-1976); Gen Y (1977-1994); and Gen Z (1995-2004).